The LawPLUS team would like to thank all JD students who attended the LawPLUS JD Q&A held last Thursday, 21 August 2014. There was a great turnout, and a wealth of knowledge and experience shared, as well as plenty of food! 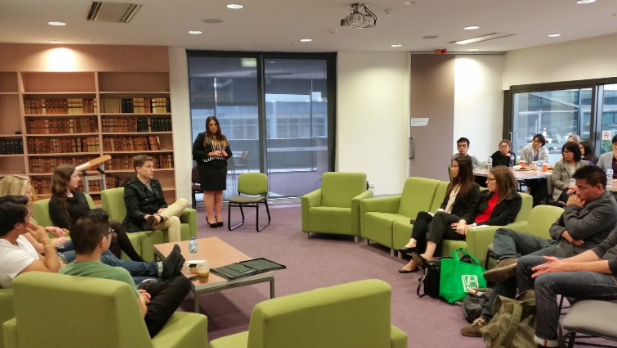 The LawPLUS team traditionally facilitates UNSW Law's first year mentoring program in Semester 1 2014 of each year, however the team also endeavours to provide ongoing support to students in Semester 2 as well as support to incoming Juris Doctor students commencing in Semester 2. If you would like to get involved as a mentor, please contact lawplus@unswlawsoc.org or keep your eyes peeled on our Facebook page as mentor applications will be opening in mid-late Semester 2. We'd like to specially thank Chester Hong, Nicole Mazurek , Marco Olea, Tim Buckley and Rebecca Stanley for sharing their wealth of experience and knowledge. It was extremely impressive and reassuring to hear how enriching their UNSWLaw School experience has been and we hope that it encourages other students to get involved to make the most of their time here! The LawPLUS team would also like to thank Co-President, Marie Iskander for her ongoing support of our initiatives. We wish all new JD students the best of luck with the road ahead and hope that you have decided to get involved with the Law Society!